Here’s a couple of classic looks on the V Star cruiser. Add a luggage rack so you can easily tie down a bag or knapsack. These accessories are shown on the 2007 V Star 1100, but are available for other V Star models such as the 650 and 1300. The billet rear fender rack is shown here with a solo seat rail. To install the fender rack remove the stock seat or pillion pad that comes with your bike. All our accessories come with installation instructions. The rear rack and seat rail are quick to install. This option allows you to keep the passenger seat and add a luggage rack behind. 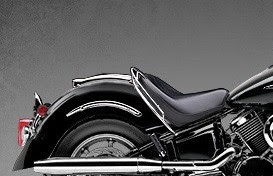 This rear rack provides a flat surface with an upswept tail in a brilliant chrome-plated finish. 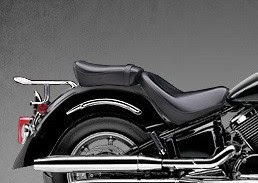 To find these and more Yamaha V Star luggage racks and accessories, always select the year and model of your bike to find the correct accessories that fit your particular bike.